Walking is a terrific exercise and is really easy and beneficial. You can do it anywhere – if you are travelling, you can walk at the airport or if you are at home, then you can walk around your block and if you are shopping then you can walk in the mall. It is great because it strengthens your heart and tones your working muscles. Walking is one of the easiest activities to fit into our everyday life. You do not need any expensive equipment or a gym membership to walk. Walking is considered a gentle low impact activity, so it is very gentle on your joints. It helps strengthen the muscles of your feet, legs and back. It also helps improve balance and coordination. Walking is safe, simple and does not require practice. Walking 30 minutes a day, five days a week reduces the rate of people becoming diabetic by over half. We are far less likely to have strokes, hypertension and heart disease when we walk. Walking can lower you low-density lipoprotein cholesterol (bad cholesterol). Walking also raises high-density lipoprotein cholesterol (good cholesterol). We resist disease more effectively when we walk. Walking improves the body’s ability to resist and recover from chronic conditions like cancer. It also lowers blood pressure. Walking also improves your immune system. We are significantly less likely to catch cold when we walk. Walking has shown to reduce cell deterioration in the brain for people who are genetically at a higher risk of Alzheimer’s. Walking improves brain health for people over the age of 60. Walking helps manage your weight by burning calories and it improves your mood. Walking can have a major positive impact on depression. Walking creates positive neurochemicals and it is the easiest health improvement strategy to maintain overtime. Walking can improve your cognitive ability. Walking strengthens the heart and bones. Walking half an hour a day has health benefits that exceed the benefits of losing twenty pounds. In fact, an overweight person who walks can have lower health risk than a thin person who is inert. No matter what the season or where you are located, walking is an easy and fun way to stay fit. Before you begin, it is important to think of a goal that you want to strive for. Maybe the first week you only want to walk around the block and the second week you want to walk a mile. It is important that you track your progress using a journal or a fitness tracker, to measure how much you are improving each week. That would motivate you to continue with your workout program. If you are walking for weight loss, you should be doing it very often – usually five to six days a week with a rest day somewhere in the week. In these five to six days, make sure you try to walk 45 to 65 minutes at a brisk pace. If you walk to improve cardiovascular health, you would want to walk three to four days a week for 20 to 30 minutes. If you are doing 20 minutes, it should be at a quicker pace at a high intensity. You should also do some light strengthening and stretching exercises, couple of times a week along with running. Some good ways to test whether or not you are at the right intensity level are the talk test and RPE. The easiest and fastest way to measure your walking intensity, whilst walking is to simply try to talk out loud. While walking, you should be maintaining a speed where, as you walk, you take a deep breath every few words. If you are able to carry on a conversation with the person you are walking with, you are not walking hard enough. Therefore, you need to pump your arms even more to get your heart rate up. The second method called RPE or Rate of Perceived Exertion. It is a scale from 1 to 10 based on how you feel. Number one being that you are sitting on the couch doing nothing and number ten being that you are working so hard, that you are about to pass out. When you are exercising, you should be working out on a level of 7 or 8. If you feel that you are not working that hard, then you need to bump it up by pumping your arms and quickening your steps. It is also important to warm-up before you begin your workout. That way you can get those muscles ready to work. You should do at least 3 to 5 minutes of warm-up that could be walking at a slower pace just before you get started with your walking workout. You can also do some dynamic stretching which means doing larger movements without holding or resting between movements. Static stretching by holding a posture is not very good for your muscles if they are not warm. A great way to hold yourself accountable and keep yourself motivated is with the use of a pedometer or an activity monitor. A pedometer is a device that counts steps by sensing your movement. Usually they clip on to your waistband or around your wrist, making them easy to wear and completely unnoticeable. Be sure to read the directions for how to properly set yours up. The simplest and the most economical way to track your steps is to download a pedometer app for your Smartphone. 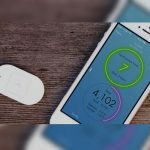 Most people own a Smartphone nowadays and most Smart phones available today have built-in accelerometers, which can be used by various apps to count your steps. Basic pedometers are inexpensive small devices to count steps, which you can place in your pocket or clip on to your belt. They can measure your steps walked, time and distance travelled. Some even calculate the amount of calories burned and some are equipped with a GPS to track the distance more accurately. The advantage of these pedometers over the advanced fitness trackers is that they have a very long battery life, which lasts for many months. Wearable smart fitness devices go way beyond average pedometers. These stylish wearable devices monitor your activity levels, which may include your heart rate, sleep patterns and synchronize that data to your Smartphone or your computer. The Smartphone unlocks a lot of information of what the device is learning about you displaying it on its nice intuitive interface and via web services that not only lets you get deep into what’s happening, but also gamify your performance against the people you know or the user population wearing that kind of device. When you walk, you should keep your body elongated and walk tall. Make sure to keep your shoulders down, relaxed, and away from your ears. Sometimes when people walk, they tend to become tense and bring their shoulders up as they pump their arms. As you walk, it is important to look 15 to 20 feet in front of you, which will help keep your chin parallel to your floor and your eyes up. If you are on an unstable surface, you may want to look directly in front of you quickly to check to make sure that you do not stumble over. It is important to maintain a good posture. You also want a smooth walking motion. Try to land on your heel, roll on your foot and push up with your toes, which is the normal pattern of walking. An added reward of walking is that you can actually work the muscles of your core by tightening your abs and buttocks at the same time as you are walking. If you are new to walking or have not exercised for a long time, then it is advised to maintain a low pace while walking, so that you do not get breathless. You should avoid carrying any hand weights or putting ankle weights while walking as this can put strain on the ligaments and tendons around your joints. You should avoid over striding. If you want to walk faster, just take smaller steps. Taking longer steps can affect your joints as well. One common mistake is starting too fast and too soon. Starting with a long distance or walking uphill or walking on the beach could be very strenuous for your body if you are not used to it. Therefore, you should start with small bouts of time on a flat surface and increase that gradually. Stairs provide a way to increase the intensity while still keeping your workout low impact. You can even use the stairs as props for strength training moves such as side squats, pushups, planks and tricep dips. The amount of steps to walk per day depends on the person’s body,age, lifestyle, eating habits, physical limitations and individual goals. You may have heard about the recommendation from the experts to take 10000 steps per day. Ten thousand steps is equivalent to roughly five miles, which is a lot more than the average steps taken per day i.e. 5117. The magic number ‘10000’ came from a marketing campaign for a pedometer by a Japanese company during the 1964 Tokyo Olympics. The number is easy to remember and many studies carried out on people walking ten thousand steps a day, found positive results. Most people that are just starting out on an exercise program should not begin with ten thousand steps. They should start with smaller goals. Federal guidelines recommend 150 minutes of exercise a week, which translates roughly into 7500 steps a day. You should visit the shoe store after completing your regular walk. This is because your feet swell up and are at the biggest size after your walk cycle. Always go for a little bigger size and ensure that there is a gap of about one centimeter between your longest toe and the front of the shoe for a comfort fit. Also, make sure that the sole of the shoe is flexible and has a bend at the toe area. It also helps that the shoe, which you pick, is the breathable, lightweight and provide your foot with good support. I love to walk. I also have a pedometer app.